1From the Desktop, press Win+I. Click the Control Panel app in the panel that appears. 3In the Internet Properties dialog box, click the Privacy tab. You should see a slider. 4Drag the slider up or down to make different levels of security settings. Read the choices and select a setting that suits you. 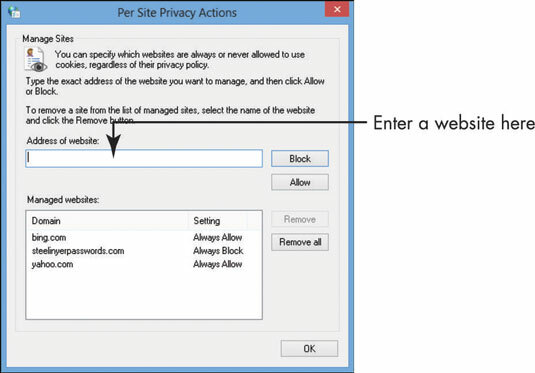 In the resulting Per Site Privacy Actions dialog box, enter a site in the Address of website field and click either Block or Allow. 6Click OK and then click OK in the remaining dialog box to save your new settings. The default setting, Medium, is probably a good bet for most people. To restore the default setting, click the Default button on the Internet Options dialog box’s Privacy tab or drag the slider to Medium. 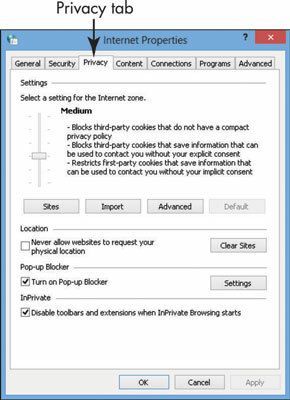 You can also use pop-up blocker settings on the Privacy tab to specify which pop-up windows to allow or block. Just click the Settings button, enter a website name, and then click Add to allow pop-ups from that site.